1990 held at Dred Scott Playfield in Bloomington, Minnesota on September 1-3. The Spooks completed their 6-0 run through the tournament by winning the final game in 10 innings over UPI 1-0. Theresa Held’s base loaded single was the game winner in the 10th inning. MVP Linda Garbett earned her 6th ASA All American selection as she led the Spooks with a 12-20, .600 performance. Held was 10-19 (.526), but was somehow overlooked in the All-America selections. This was her 13th year with the Spooks. Spooks shortstop Terry Schweikert was 13-20 (.650) and played lights out defense. Pitcher Nancy Garbett, sister of MVP Linda Garbett was named for the 5th time in her career. Kinder Insurance (Springfield, Mo.) 2. Spooks (Anoka) 3. Spooks (Anoka) 8, Lakerettes (Conneaut Lake, Penn.) 3. 1990 held at Tupelo, Mississippi on August 30-September 1. Mark Tremblay has been chosen Most Valuable Player in a national tournament before, but never as a pitcher. Sept. 3 he did just that for Sikorsky Aircraft of Shelton, CT.
Tremblay’s hard-nosed play up the middle sparked Sikorsky’s defense. giving the team its sixth ASA Men’s Major Industrial Slow Pitch National Championship since 1979. Sikorsky beat the MCA Pipefitters of Cincinnati 8-1 in the championship game at the Eastwood Softball Complex in Tupelo. MS.
Sikorsky rode a rough horse into the championship. beating defending champ Delta Re/Max from Fayetteville, GA, 12-10 Sept.2. The Connecticut team shutout MCA 4-0 in the winners bracket finals. Tremblay’s defense was a big part of that win. Sikorsky’s 4-0 win dropped MCA to the losers bracket final, where it beat Rohr #1 of Foley, AL. 6-3. In the championship game Tremblay only had three chances, but he earned the out every time. MCA manager John Henegar said Sikorsky’s defense, combined with MCA’s lackluster hitting, made the difference in MCA’s first tourney appearance since 1981. Temperatures climbed to 100 degrees, but neither coach complained about the heat. “We kind of like hot weather,” Sikorsky’s Gene Kwalek said. Every national tournament we’ve played in for be last five or six years has been in the South or Southwest. Sikorsky finished the tourney 6-0. while MCA came in at 6-2. Third-place Rohr was 5-2. while the Dow Pirates of Lake Jackson. TX, were 5-2 in fourth place. The big story was whether Steele’s Silver Bullets could complete the Grand Slam of Slow Pitch. 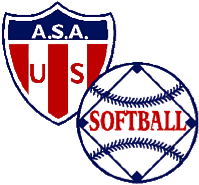 They had previously won the ISA, NSA and ASA World Series and were trying to be the first to win all four Championships in the same year. Sports Heros of Minnesota stunned Steele’s in their first game by defeating them 21-18. After defeating the Las Vegas Aces and then Lighthouse of Stone Mountain, GA, the Men of Steele’s were eliminated by Bell Corp 29-28 on a 2-run walk off HR by Bell Corp’s Hal Harlan. The Grand Slam would have to wait. This tournament belonged to Cecil Whitehead and the Ritch’s/Kirk’s squad as they went undefeated and defeated defending champ, Superior/Apollo 35-14 in the Championship game. Whitehead was 4-5 with 2 HRs and 5 RBIs and made some of the most incredible catches in left field. He was the HR and Batting leader of the tournament. Britt Hightower (4-5, 2 HRs, 6 RBIs), Greg Whitlock (4-5, 2 RBIs), Charles Wright an Rick Wheeler (3 HRs each) led the R/K offense. Clyde Guy was 4-4 for Superior/Apollo in a losing effort.